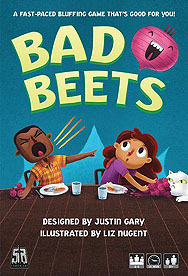 Bad Beets is a fast-paced game of strategy, deception, and eating your vegetables! You can try to get rid of your Beets any way you like, whether by sharing them with a friend, feeding the dog, or *gulp* actually eating them! You can bluff your way to victory, but if other players call you out, you better have the right card!